House prices will continue to fall in the near future, the Nationwide building society has suggested. The lender said potential buyers were being deterred by the uncertainty generated by the government's public spending cuts. The society has seen its half-year profits rise by 81% to £259m. "In the housing market, conditions have weakened noticeably over the last six months, with both a decline in buyer demand and a modest downward trend in house prices," said the Nationwide's chief executive Graham Beale. The Nationwide's own monthly survey showed recently that they had dropped by 3% since June and were only slightly higher than they were a year ago. Despite the stagnation of the property market, the Nationwide's own finances have improved in the first half of 2010. The rise in half-year profits was inflated by a one-off profit from financial derivatives aimed at hedging against adverse interest rate movements. But the value of bad debts on the society's residential mortgages fell by 44% to £179m. Only 0.67% of Nationwide mortgages were three months or more in arrears, which it said was less than a third of the industry average of 2.15%. The society also said interest rates would probably stay very low for another year. "The Bank of England is likely to keep interest rates near record low levels for longer in order to offset the dampening impact of spending cuts," said Mr Beale. "We do not expect any change in the Bank of England base rate until late 2011, despite inflation remaining above the government's target." All rather bullish really, given the state of affairs. It's over, the ships going down. The problem is, a lot of the good are going to be taken down with it alongside the bad. From the BBC?? How very dare you. Indeed. It's preparation for the obligatory "don't panic: it was predicted" response we'll get next year when there's no spring bounce. When are nationwide's monthly figures out? Are they preparing the ground for a biggy? Nah, they are winding us up. Gross residential mortgage lending 6.0 billion, 8.5% market share (30 September 2009: 8.3%). Approx 22% of gross lending was BTL. Net residential mortgage lending -1.8 billion, (4 April: -1.9 billion). Average LTV on new lending 64% (4 April 2010 63%). Indexed LTV for whole mortgage portfolio 47% (4 April 2010 48%). Residential mortgage accounts more than three months in arrears 0.77% (4 April 2010: 0.82%). CML average = 2.15%. Prime mortgages more than three months in arrears 0.53% (4 April 2010: 0.54%). Specialist (BTL, self-cert etc.) mortgages more than three months in arrears 2.77% (4 April 2010: 3.37%). Wholesale funding ratio 26.1% (4 April 2010 27.8%). Commercial balances three months or more in arrears 3.43% (4 April 2010: 2.90%). If 2.15% is average, and the biggest lender has only 0.67%, then the small guys must have quite a bit higher arrears rate. and with rates on SVR at around what...3.5%....that means than many banks are likely barely breaking even on mortgages. And they are having to pay their securitizers too. EDIT Nationwide SVR is 3.99%. 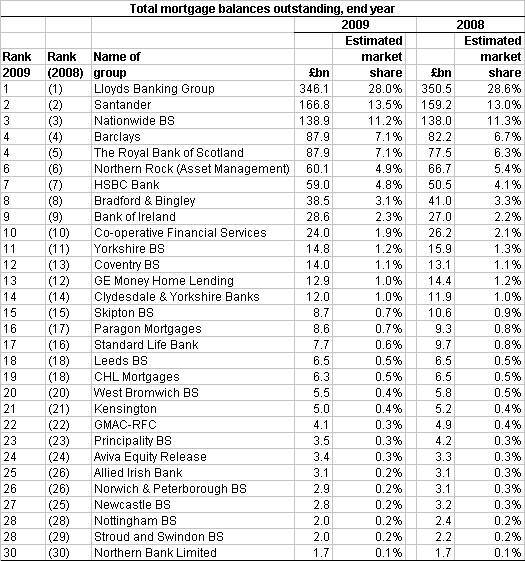 NWide aren't the biggest lender, just the biggest BSoc. I think Santander probably p*ss all over them, especially in arrears. When are Nationwide's stats out for the month? question is, how do they then classify the delinquents....are they included in the above arrears, or do the payments go off the oldest month first, so, possibly, a 3 month behind could become a 2 month behind due to the benefits. Not that I think figures are ever massaged...that would mislead people. Speculators do not base their property buying/selling decisions on interest rates. It's simply a case of: will prices go up or down? As soon as they see prices going down they will sell leading to lower prices, more selling etc, etc = crash! And in case you're wondering the vast majority in property at these dizzy heights are speculators, even those that insist they're not. interesting, so they probably WERE the biggest before all the bailouts etc etc. My BSoc says they will lend up to 4x my salary! I'm not sure I want to borrow that much! I reckon a lot of the "middle class buyers" use the nationwide...you know, the ones, paying well over the odds for top end properties because they have massive equity in their own homes. The ones, artificially keeping the nationwide index high. Now chains are breaking down left right and centre and FTB's are on strike...the top end properties prices will have to start falling and when they do reality will strike. The top end home seller are the last of the rats on the sinking house price ship. So from this respect I think the nationwide index falls will have a BIG psychological effect on the middle class equity rich buyers...the same buyers that cant sell because chains are non-existent and those "cash buyers" have dried up. I can't see anything but bug falls to come. Low interest rates wont save anyone this time and the forthcoming (whenever) wise will collapse the market...this is the only reason they haven't realised them so far...they know they need to but they know they can't. Grab the pop-corn and a comfy seat in you rented property...this is gonna be worth watching. I truly got a shock yesterday at the number of For Sale signs which have sprung up around me in Edinburgh, mainly flats. I think many are starting to panic, to them falling prices means lost money, that is not why they got into this. My usual advice.... don't panic... don't panic....panic first !!!!! Well seems to me with their monthly figures out next week, they will be down but not by much, maybe -0.5%. Has anyone dug down into their accounts? Is the profit improvement entirely down to the drop in bad debts or are they actually increasing lending? Reuters has a note in their analysis re the cap. Nationwide also said it was losing out on 300 million pounds per year because of a pledge to cap its base mortgage rate at two percentage points above the Bank of England rate, relative to the typical 4 percent rate offered by other lenders.